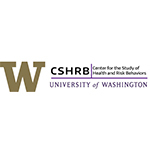 The Center for the Study of Health and Risk Behaviors is administratively housed within the Department of Psychiatry and Behavioral Sciences at the University of Washington. Our mission is to eradicate the harm caused by engagement in a variety of health risk behaviors, through the development and implementation of novel prevention and treatment approaches. We seek to understand the unique and common factors underlying the development and maintenance of addictive and health risk behaviors, their co-morbidity with other mental health disorders, and the effective elements of prevention and brief treatment as applied to a wide range of presenting problems and special populations. We also seek to understand healthy developmental transitions and ways to increase positive health behaviors.